As I finish reading Walter Odajnyk's Gathering the Light, I see a very synthetic imagination at work to bring the reader closer to what unites rather than separates Eastern and Western thought on meditation, the mystical and the means to unite the two ways the soul may engage spirit. At the same time, his book offers a short course on C.G. Jung's ground-breaking thought on the soul inhabiting all things of the world. Lost in our ADD-oriented culture is the art and practice of meditation, not just on matters of the spirit but on the everyday matters we contend with, often on the fly, fast and loose, with little due regard for consequences. Perhaps the president of the United States should include on his board of advisors a resident meditator; that person's task would be to slow down the processes that can have as their consequences war, ignoring the most in need, loss of a sense of fair play, justice denied and oversights that can diminish the earth's richness. Is this a spiritual book? Yes and no. Its wide range and depth of perception on the spiritual body can be appropriated on a number of levels to coax the reader into living a fuller and more deeply attended life. Walter Odajnyk was a graduate of the C.G. Jung Institute in Zurich and a member of the C.G. Jung Study Center of Southern California as well as a core faculty member of Pacifica Graduate Institute. He is the author of Jung and Politics: The Political and Social Ideas of C.G. Jung; Gathering the Light: A Jungian View of Meditation, and Archetype and Character: Power, Eros, Spirit and Matter Personality Types. 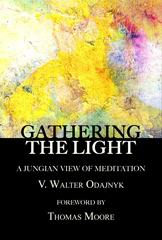 Grateful to be the publisher of Gathering the Light: A Jungian View of Meditation, Fisher King Press plans to keep Walter Odajnyk's light shining for years to come.